When I first saw recipes for chocolate zucchini bread, I immediately wanted to try it because I was so curious about the taste. 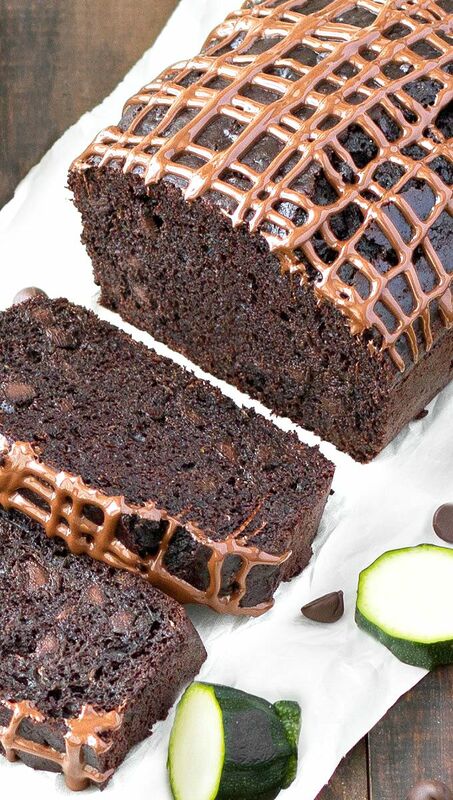 Chocolate and zucchini….sounds odd right? Don’t get turned off, you can’t even taste the zucchini in this bread, it tastes pretty much like a chocolate cake. 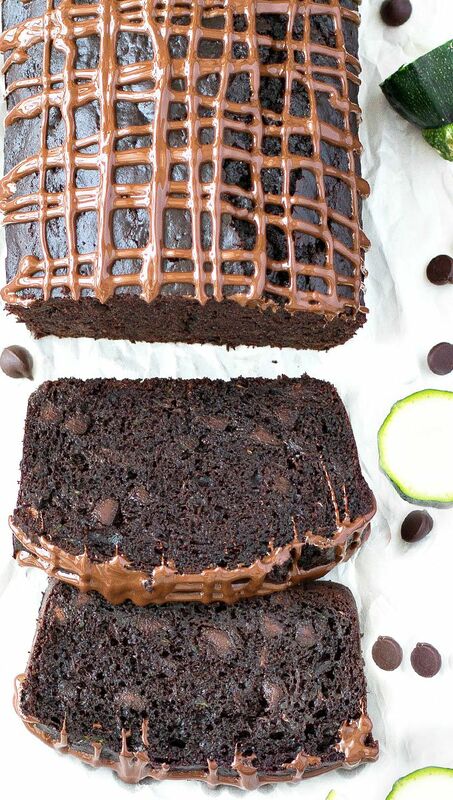 This easy double chocolate zucchini bread is rich, tender, fudgy and wonderfully moist! Zucchini are the secret behind the moistness. 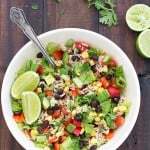 The recipe is pretty straight forward and comes together so quickly. 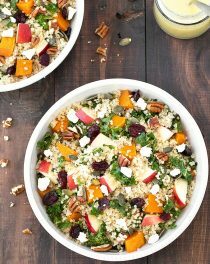 No need to get out your mixer – just two bowls, a whisk and a wooden spoon! 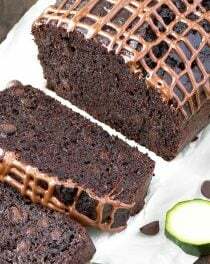 I adapted the recipe of this double chocolate zucchini bread from Joy of Baking and the result is truly delicious. Even though it’s loaded with chocolate chips and can’t be considered healthy, I tried to lighten it up using half oil and half 0% fat Greek yogurt and reducing the amount of sugar. You could lighten it up even further if you eliminate the chocolate chips and the chocolate drizzle on top. Place the shredded zucchini between two paper towels and press out as much water as possible before you stir them into the batter. Don’t over mix the batter or you will get a tougher bread. Make sure the bread is fully cooked before taking it out of the oven or it will sink in the middle. This bread does take a while to cook. I baked my bread for 50 minutes, but every oven is different! 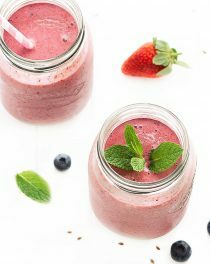 I recommend making a double batch because it freezes really well and it disappears quickly. Make a pot of coffee and enjoy this easy double chocolate zucchini bread for breakfast, as a snack or as a dessert! Preheat the oven to 180 degrees C (356 degrees F). Grease (or spray with a nonstick spray) a 23x13 cm (9x5 inch) loaf pan. Set aside. Place the shredded zucchini between two paper towels and press out as much water as possible. In a large mixing bowl, whisk the flour, cocoa powder, baking soda, baking powder, salt and chocolate chips. In another bowl, beat together the eggs, sugars, Greek yogurt, vegetable oil and vanilla until smooth. Fold in the zucchini. Pour the batter into the prepared pan and bake for 45/55 minutes or until a toothpick inserted in the center comes out clean. Remove from the oven and cool in pan for 10 minutes before cooling on a wire rack. Melt the 45 grams (1/4 cup) chocolate chips and drizzle on top of the bread. Store this easy double chocolate zucchini bread in an airtight container in the fridge for up to 5 days, or freeze for up to 3 months.